The plastic foil has a lightweight French style ambidextrous handle. The blade has a tapered section with great flexibility and adequate stiffness, no metal parts inside that could be dangerous. 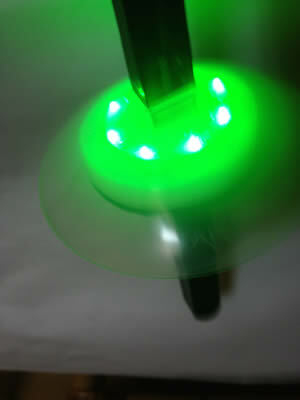 10 LED’s Choice of Red or Green included in the guard in addition to one/two tones audible buzzer with 2 second scoring time and an ON/OFF switch : no trailing wires required. Special rubber tip covering button at point of the blade. Easy to handle and safe to use Weight only 100g, length 85 cm. Available in black.